IslayBlog.com -> 2009 -> Islay - It's a Miracle! Islay - It's a Miracle! Yes, that's the silhouette of Islay. On a pancake. Is it a sign? Well, my next holidays on Islay are booked for April and June. PS: No, I didn't make a cooked breakfast on Sunday. 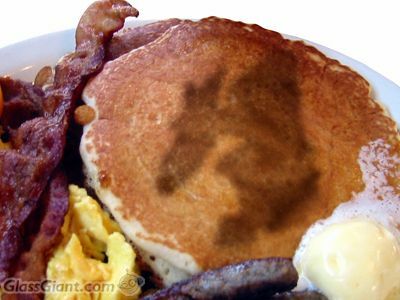 No, there wasn't a pancake with Islay on it. Create your own miracle with the Miracle Maker (via The Ben Lomond Free Press).